So… this week’s S&F took a convoluted path. I have been (trying to) read Camus’s Myth of Sisyphus and was ranting about how perplexed I was by certain passages. My friend took that opportune moment to introduce me to Thomas Nagel, more specifically his essay on “What is it like to be a bat”. Now who could turn down a (short!) essay with a title like that, especially when it also contains such rarities as: “Even without the benefit of philosophical reflection, anyone who has spent some time in an enclosed space with an excited bat knows what it is like to encounter a fundamentally alien form of life.” Is that.. a sense of humour one can detect?! I thought that was fundamentally alien to philosophers! More seriously, it is a rather good essay that discusses how difficult it is to truly “get” something or somebody else without experiencing everything they do in their exact way. I suppose our shared experience of life itself is the one major thing we all have in common, but within that so much else can differ, making relating to each other form a sort of tragic Venn diagram. 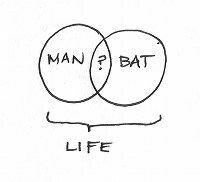 This entry was posted in Philosophy, S&F Cartoons only and tagged nagel bat essay, philosophy webcomic, simon and finn, thomas nagel, thomas nagel bat, venn diagram philosophy, what is it like to be a bat by simonandfinn. Bookmark the permalink. You are quite right that it is difficult to truely “get” something or someone else without experiencing everything they do. Although he is writing about bats I couldn’t help to continuous think about how we all struggle as humans to understand each other: religions, politics, genders, race. Hello Mr. Swift.. 🙂 thanks as always for your insightful comments.. I had the same thought when I read his essay, how much this relates to our understanding and “getting” of each other. Great quote you picked out.. “such an understanding may be permanently denied to us by the limits of our nature..” How true..
And yet, perhaps the intersections of experience make things most interesting. Oh, indeed they do. I live for them. HI, heard about Nagel’s essay a while back, never read it fully, thanks for the link. 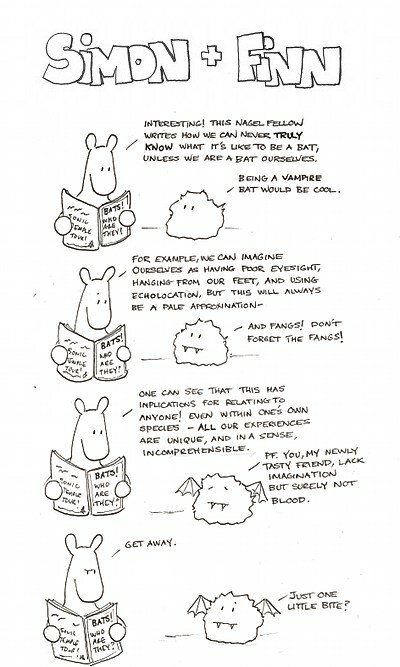 Re: the spelling of echolocation, LOL, environmental bats. Nice. Most of us tend to judge others from a distance. It’s just easier that way, and less messy, too. If we moved in closer, we’d get a more accurate picture, but who has the time? How many of these strips have you done now? Is it time for a book of them? Good point about the time… the ease.. and the reduced mess! That said, some of the nicest moments in my life have come from connection, “surprised by joy” as C.S. Lewis put it. I’ve done about 60 of the strips on the blog now.. they were pretty rough when I first started but slowly getting there. Re: book that would be fun! I’m starting by submitting the occasional strip to various publications here and there to judge interest.